Canwest News Service article, July 4, 2008. New series explores folk roots. Article in the Globe & Mail, July 5, 2008. David Grierson talks to Gary Cristall. "At the 2001 Folk Alliance conference in Vancouver, the late broadcaster David Grierson and former folk festival programmer Gary Cristall gave an inspired tour through the history of folk music in English Canada. They wove some tales and played some great music from our folk history. CBC was there for the event, and we bring the whole story to you." Where did folk music in English Canada come from? Why does it sound the way it sounds? Who did what, when and why? I’ve been trying to answer these questions for almost a decade. Over those years I’ve compiled hundreds of hours of interviews, thousands of pages of notes and photocopies. The answers are going into a book I’m writing. My research is now in the sixties and heading for the seventies. Help me! I want your memories, the contents of your basements- ‘informal’ tapes you made at folk clubs or at your group’s rehearsals, festival programs, club flyers, newsletters, posters and most of all, the Hootenanny sweat shirt Eaton’s sold in 1964! - just about anything that sheds light on how folk music developed. Check out my book outline. If you’ve got something I might be interested in, email, write or call now. After 50 years The Milestones, probably the finest folk music ensemble that existed in Vancouver in the sixties have a CD, and a double CD set at that! Why in the world put out a CD of recordings by an obscure folk group fifty years after the recordings were made? Art and history, two of the most important things in the world, that’s why. I came across The Milestones by accident. Folk music historian that I am, I admit to spending most of my life in ignorance of what I now feel to be the finest folk music group in BC in the sixties. Kurtis Van El recorded hundreds of hours of folk music at the Question Mark, Vancouver’s first folk music coffee house. We were listening to another group when I was struck by The Milestones. These folks could really sing! The fact they were all in Ukrainian choirs came through in the harmonies as well as the solos. 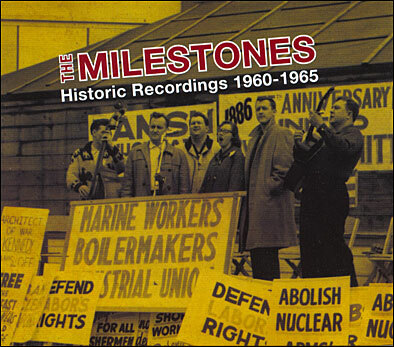 In a time when few folk singers could really carry a tune, The Milestones stood out. So did their repertoire. It was a classic body of songs that encapsulated what folk music was during the late fifties and early sixties - Wobbly songs from the IWW Little Red Songbook, songs from the People’s Song Book that came out of People’s Songs and its successor, Sing Out! (the classic repertoire of the left-wing folk song subculture) and a few gems of eastern European music that was a marker of the ethnic origins of the group’s members. It was, and is, a time capsule of what folk music sounded like in the period before the term came to mainly mean songwriters. I tracked down the group’s surviving members and at a reunion-like meeting they told me that they had tape from their 1965 (then as a trio) sold out Hootenanny at the Queen Elizabeth Playhouse. If that wasn’t enough, they also mentioned that they had made a record that same year for the BC Federation of Labour (BC Fed) to commemorate the fiftieth anniversary of the execution of Joe Hill, the Wobbly songwriter and organizer, and the tenth anniversary of the founding of the BC Fed. The 1965 recordings take the story of both The Milestones and folk music further. Now the impact of the singer/songwriters who were redefining the term folk music was part of the Milestone’s repertoire. Songs by Tom Paxton, Oscar Brand and the Montreal songwriter, Art Samuels joined their older repertoire. There were Milestones’ originals - Judy’s Lament, in reference to the Minister of National Health and Medicare in Lester B. Pearson’s government, and Medicare, the new socialized medical system which had just come into place. The BC Federation recording had the predictable labour standards but also included two songs from BC working class history - Grand Hotel, and a never before recorded IWW lullaby - Rock-a-bye Baby. Paxton’s song, I’m The Man Who Built The Bridges, which they had recorded at the Hoot, was now joined by two Bob Dylan songs - including a great version of the rarely recorded When The Ship Comes In. There was also a song by local songwriter and Question Mark founder, Peter Wyborn, describing the experience of working for the Rogers Sugar Refinery, a local landmark. PO Box 21547- 1424 Commercial Dr. If you order more than one, the $3.00 shipping will cover the costs of as many as you want. The fruits of my research to date were unveiled in the summer of 2008 on CBC Radio – in a five part series called The People’s Music on Inside The Music. Read about the series and a summary of the episodes. Copyright © 2008-2015 Gary Cristall. All rights reserved.